The situation for drone pilots in Uganda is quite complicated. In this article, you will learn what you need to know for your trip to Uganda with a multicopter. 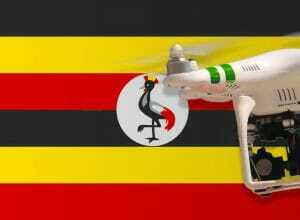 In Uganda, you need an import permit to bring a drone to the country. You have to send the application minimum three months in advance. If you arrive without this permit, the drone will be picked up at the airport and kept until your departure. So if you want to visit other countries after your trip, you can take your Copter with you if you choose the same airport for arrival and departure from Uganda. Otherwise, I would leave my camera drone at home. But only with the import license, it is not done. Also, permits are required for each flight. In your application, you must specify the purpose of the flight, drone details (including model/manufacturer/mounted equipment). Part of the appeal is also a map in which you mark your flight area. In some cases, additional releases are required from different authorities (e.g., the Department of Defense). Before you can upgrade your drone, you must also submit your state registration and demonstrate your practical flying skills. If you manage to overcome all these bureaucratic obstacles, then you need to be in permanent contact with air traffic control during your flights. The use of drones in Uganda is not allowed over cities and crowds. In short, it’s almost impossible to launch a drone in Uganda. If you want to try it, I wish you a lot of stamina in applying for the necessary permits. We have researched the listed drone regulations for Uganda to the best of our knowledge. We cannot guarantee the correctness of the information. If you want to be on the safe side, contact the competent aviation authority. Alternatively, you can also ask the embassy in your country for further information about the regulations. Please leave us a comment when you receive news and/or gain experience with your copter in Uganda! I agree with you. It is even becoming more complicated to carry a camera around Kampala or if you are near a crowded area. Soon, we shall see a lay on mobile phones with cameras. I would start with the things mentioned above. If you can master this, you will get in contact with persons who can help you further. Please let me know what experiences you collect. It seems impossible to bring my drone to Uganda. I only have a month left until departure but i will give it a try. Have you got an answer from the authorities? Unfortunately I never reached the authorities and I didn’t bring it with me to Uganda because Qatar Airways’ wants passengers to bring drones in hand luggage, and I didn’t have any free space left. The authorities scanned the hand baggage and checked baggage before we left the airport, because of increased terror risk (probably caused by the terror attack in Kenya). I think my mavic 2 pro would have made it through because it is small and doesn’t look like a drone in the x-ray scanner. I think they would discover a phantom 4 and be very suspicious if you don’t have a permission because of the increased terror risk.